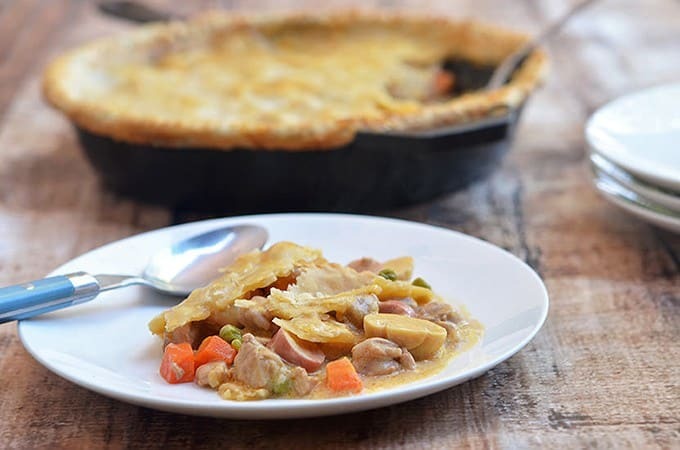 Chicken Pastel or Pastel de Pollo with creamy chicken stew and flaky pie crust is the ultimate comfort food! 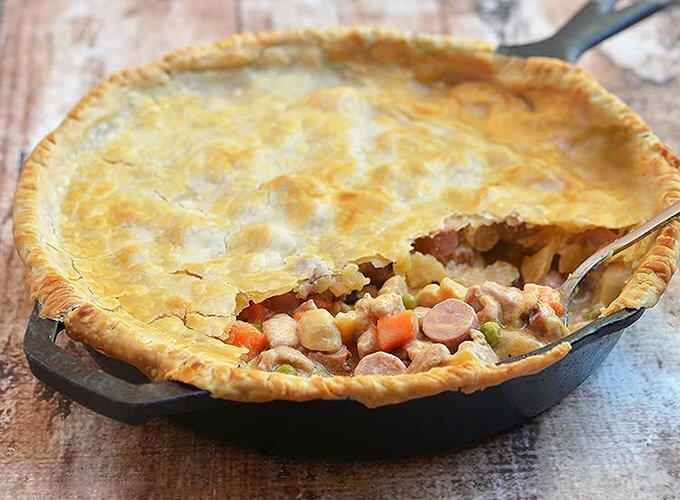 Hearty and tasty, this Filipino-style chicken pot pie is sure to be a family favorite. I set out on a 24-days-to-Christmas countdown at the beginning of December with a goal to share with you a party-friendly dish every day. Well, the best-laid plans of mice and men often go awry. I was doing well, posting daily for a week, but then we had to take a trip to Austin, Texas and I ended up missing a few days of work. But hey, there’s 11 more days to Christmas; still plenty of time to get all the delicious holiday recipes up on the blog. To continue on our special series, here’s one of my party favorites, Chicken Pastel. If you’d like to check out the most recent recipes in our holiday recipe lineup, check out oven-roasted pig head and beef stir-fry with baby corn. 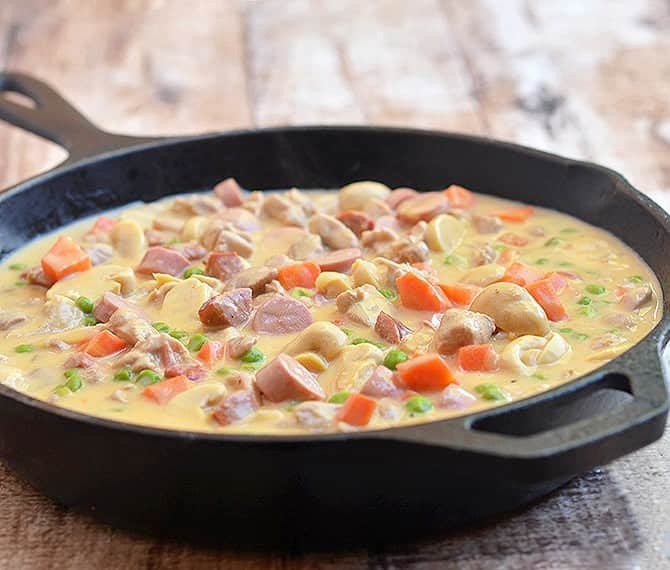 Chicken Pastel is a hearty stew made of diced chicken meat, sausages, mushrooms, peas, and carrots in a rich, creamy sauce. 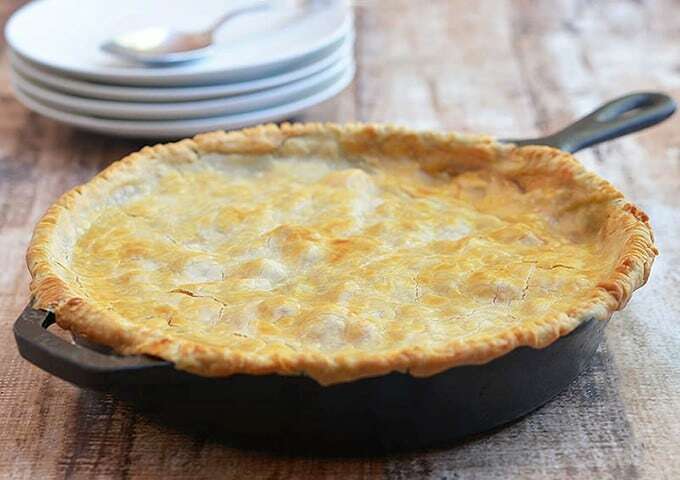 Adapted from Spain’s pastel de pollo, the chicken filling is encased in a flaky pie crust and baked until golden. 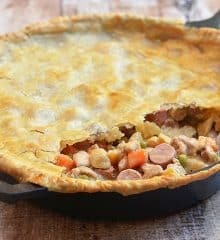 It’s common practice, however, to serve this Filipino-style chicken pot pie sans the crust but paired with rice instead. Either way, it’s a satisfying meal that’s sure to be a family favorite. Although the dish is traditionally made with a top and bottom crust, I opted to do without the bottom crust because I was, um, lazy. As you can see, I from the photos, I didn’t even bother transferring the mixture into a baking dish. Most of the work in this recipe is putting together the pie dough. 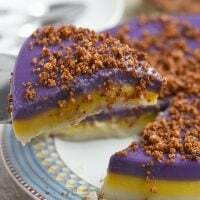 You can, of course, skip it and serve the pastel with rice but I really urge you to go the extra mile. That buttery, crisp layer makes the dish extra special with additional flavor and texture. For the flakiest crust, have ingredients very cold. This inhibits gluten formation, resulting in the flakiest crust. Using very cold fat inhibits gluten formation and helps keep from overworking the dough. Limit the amount of liquid and add just enough to make the dough hold together. Make sure to use ice-cold water. Large specks of fat/butter in the dough are ok. Do not overwork the dough as this develops gluten and makes the crust tough. Before rolling the crust, chill for at least 30 minutes. If the dough feels soft between rolling, freeze for about 10 minutes. 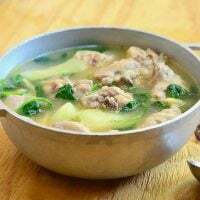 In a bowl, combine chicken, lemon juice, and soy sauce. Marinate for about 10 to 15 minutes. Drain meat, reserving liquid. In a wide pan over medium heat, heat oil. Add chorizo de bilbao and cook for about 1 to 2 minutes or until lightly browned. Add chicken and cook for about 3 to 5 minutes or until lightly browned. Remove from pan and set aside. Wide down pan as needed. Add butter. When it begins to melt, add onions and garlic and cook until limp. 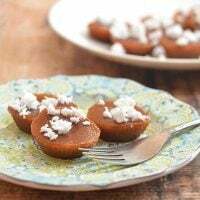 Add flour and cook, stirring regularly, until lightly browned, bubbly and begins to smell "nutty'. Add water and reserved marinade,, whisking vigorously to prevent lumps. Bring to a boil until smooth and slightly thickened. Return chicken and chorizo to pan. Season with salt and pepper to taste. Lower heat, cover and cook for about 15 to 20 minutes or until chicken is cooked through. Add carrots and cook for about 3 to 5 minutes or until tender. Add green peas, mushrooms, Vienna sausage, and evaporated milk. Stir to disperse. Continue to cook for about 3 to 5 minutes or until vegetables are heated through and sauce is thickened. Transfer filling onto an oven-safe baking dish. 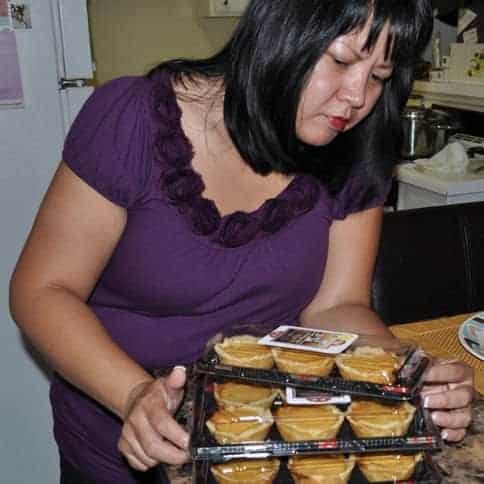 Gently top filling with the crust and seal edges with a fork, trimming edges if necessary. Cut about a 1-inch vent on the crust. In a bowl, combine egg wash: egg and water. Whisk together until well blended. Lightly brush top of crust. Bake pie in a 400 F oven for about 20 to 30 minutes or until filling is bubbly and crust is golden. If needed, cover edge of crust with strips of foil at the last 5 to 10 minutes to prevent from excessive browning. Remove from heat. Allow to stand for about 5 minutes and cut into serving portions. Cut butter into cubes and freeze for about 1 hour. In a bowl, whisk together flour, salt, and sugar and chill in the refrigerator for about 30 minutes. Add butter to flour mixture. Cut the butter into the flour using a pastry blender or by pinching the fat into the flour mixture with hands. Add shortening. Work mixture together until resembling coarse cornmeal, with pea-like, butter-speckled pieces. Slowly drizzle in water and with hands, mix the dough until just combined. If dough is too crumbly and does not hold together, add more water a tablespoon at a time. DO NOT ADD TOO MUCH LIQUID and DO NOT OVERWORK DOUGH. Gently gather the dough and press into a ball. Wrap dough with plastic wrap and chill in the refrigerator for at least 30 minutes. Place the pie crust between two sheets of parchment paper and with a rolling pin, gently flatten into 1/4-inch thickness. Another delicious recipe! Made this yesterday but did a little shortcut. I used the store bought ready made puff pastry for the crust. And instead of sausage(don’t like ’em), I used cubed ham and added some roasted chestnuts cut in half, just like what my late Mom used to do. Came out really yummy! Thanks. 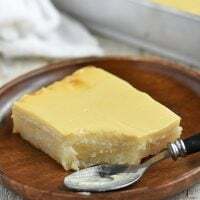 Your recipe brought back some childhood memories! I like the idea of adding chestnuts, gives the dish a bit of texture. Thanks for the tip, I am glad you enjoyed the recipe. Would I be able to use any pre-made dough? ie.. those “ready to make croissant”? This dish looks sooo delish! I can’t wait to try it! You’re recipes are always a hit!